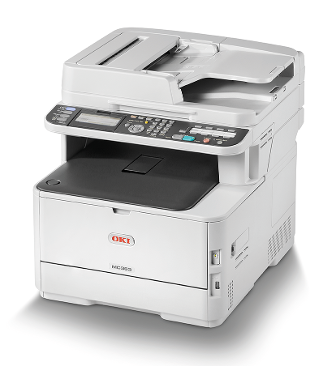 The OKI MC363DN is a multi-function combined printer, scanner and copier designed for use in a small to medium business. It can efficiently and economically carry out a range of essential office functions, including faxing documents, and can be shared by up to 10 workgroup users at a time. Duplex printing is standard, and the easy-to-use controls and intuitive menus make operating the machine simple. It is ideal for processing high-volume print batches, and it takes a USB stick so a PC is not needed. This four-in-one printer measures 25x21.6x22.4 inches and weighs 34.2kg, making it reasonably easy to move around and fit into limited office space. It process prints at 22 ppm for colour and 24 ppm for mono output, with double-sided printing automatic. Scanner speed is 20 ipm for colour and 30 ipm for mono, with optical resolution of 1200x1200 dpi, and scanning too is double sided. The copy speeds for colour and mono are 22 ppm and 24 ppm respectively, and the fax speed is 33.6 Kbps. The interfaces are network and USB, and the unit is delivered network ready and Airprint compatible. Operations are controlled from a 3.5-inch LCD panel. The ability to network up to 10 users is very useful for a small or medium-sized office and the fast printing and scanning speeds enable the OKI MC363DN to easily handle substantial print jobs at one go. The optional second paper tray takes up to 530 sheets to facilitate this, and the RADF double-sided paper handling and use of the PS and PCL printer languages make this a flexible and powerful piece of kit. The OKI MC363DN may be too large for a small business, and it lacks the comprehensive cloud and social media connectivity offered by some other, smaller models. The 54dbA noise level may also be judged too high for some environments.